4. Fourth House ruled by Sun which is square Pluto. 5. Sun square Pluto, conjunct Vindemiatrix ("the widow star"). AnonymousOctober 2, 2017 at 8:38 AM heis a terrorist! that was auto weapons fire.(ak? )where does a wealthy 63 year old man get an auto weapon? also, who let him into the hotel with a pileof guns? ReplyDelete AnonymousOctober 2, 2017 at 9:26 AM The only thing he didn’t plan on was … smoke. Smoke from his weapon firing apparently set off the fire alarm in his room, giving Vegas cops his precise location very quickly. Imagine how many more might have died if it had taken, say, three extra minutes to track him down. ReplyDelete Spacer79October 2, 2017 at 1:08 PM Now the gun grabbing liberals are having a field day. They probably help set it up to advance their agenda. Another case of Hegelian Dialectic. ReplyDelete Replies astrolibertarianOctober 2, 2017 at 2:42 PM Give yer guns to Antifa if you love babies. Delete Reply Spacer79October 2, 2017 at 6:46 PM Hahahaha ReplyDelete AnonymousOctober 3, 2017 at 6:05 AM he killed people because of gambling debts? why didnt he go downstairs to the casino? he was preparing for a siege. he targeted that festival HE WAS A TERRORIST! ReplyDelete Spacer79October 3, 2017 at 7:54 PM This was a false flag planned by the deep state. He is probably a patsy. ReplyDelete AnonymousOctober 4, 2017 at 6:22 AM i was in mesquite 2x in the 90's it is a nice place. i wonder if he bought all his weapons from guns and guitars! shows you about ethics these days. the horoscope chart i saw shows a very tough haul/ four oppositions ! ReplyDelete AnonymousOctober 4, 2017 at 8:08 AM he checked in on sept 25. he had room service and nobody saw any guns? he had a guest and nobody reported he had guns? he had over 20k worth of high end firearms in that room,most illegal in clark county, as for the clark county sheriff: he is a liar! 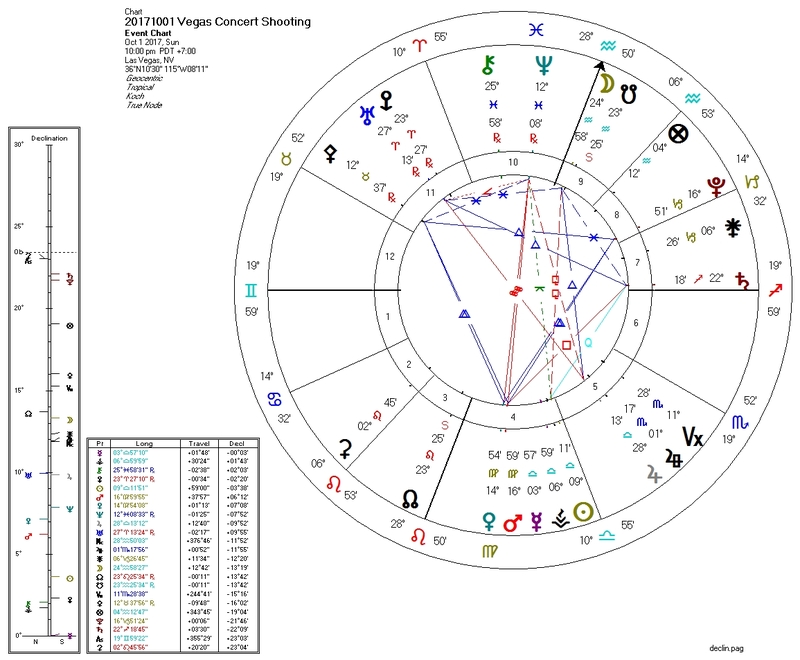 his chart shows an easily deceived and manipulated person: a drama queen motivated by ego and adventure. i'll bet he was a kalista,also ReplyDelete Replies astrolibertarianOctober 4, 2017 at 8:20 AM If you have charts, feel free to share them.